Many print publishers I talk to are surprised by upstart "web only" media companies that drain online ad dollars out of their markets. Established media should hold all the cards; an established brand, a history in the market, and access to online list development via the magazine subscription process. How do these web only "pure plays" stand a chance? Simple, they love search more than we do. 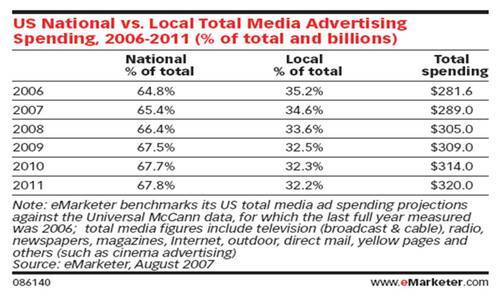 A study from Borrell Associates entitled, "WHAT LOCAL MEDIA WEB SITES EARN: May 2008 SURVEY", uncovers the strategy in the regional magazine market that should raise alarm for any magazine, anywhere. "The most financially successful local Web operations are venturing into page designs and product lines that have little to do with the medium that gave birth to them. Like their “new media” predecessors in radio in the 1920s and television in the 1950s, they are creating unique identities and breaking away from their print and broadcast roots." 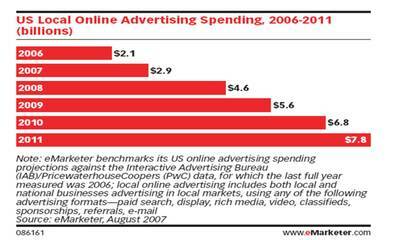 "Part of the growth is being driven by traditional local media companies selling advertising on their own sites. Most of it, however, comes from pure-play companies delivering lower cost advertising that intercepts consumers not as they are reading news online, but as they are using the Web to research products and prices." "Intercept" web visitors as they "research products and prices"? That's "search." Without a print brand to drive visits to a site "search" is how they do it. Simply put, "pure plays" are playing the Search Engine Optimization game better, and are able to establish competitive brands as result. Keep the “pure plays” from cleaning your clock! It is happening right now in many many industries and sectors. Web only competitors, "pure play" online publishers, are sneaking in and winning ad sales away from the online products of print publishers. How can they do this? Don’t we have an insurmountable advantage by having a print product continually advancing our brand in the physical world? How do the pure play Internet companies even stand a chance? "Pure plays" routinely beat the products of print based publishers because they design a new newsletter, webinar, web section, or website, by starting with a clean sheet of paper. Since they have no print vehicle to get them started the "pure plays" design a media product desperate for attention. Every click through they get has is funneled from somewhere else so there has to be an amazingly good reason for a visit. This “clean sheet of paper” approach results in a high emphasis on focus and functionality. It takes an extremely sharp content focus to stand out against the millions of online destinations and when a visitor arrives there must be a high functionality that keeps visitors coming back. Print people are spoiled. Too often when a magazine launches a web product the editorial focus the same or similar to the positioning as the print product. As for functionality, too often the mission statement is, “To extend the magazine brand onto to the Internet.” Big mistake. Your website needs its own editorial focus, and mission. While it should compliment your print product it cannot just extend it. To compete, pretend your print product does not exist, then ask, "Given all online destinations and content on the web, why should anyone visit my website?" To beat the pure play publishers, you have to think like one. You too have to start with that clean sheet of paper and work your way forward. Is magazine myopia going local? Why didn't someone at Sports Illustrated start ESPN? Why didn't someone at Time or Newsweek start CNN? Why didn't someone at Rolling Stone start MTV? Whey didn't someone at National Geographic start the Discovery Channel? The list could go on...but I fear history could be repeating itself, this time with regional magazines. First, chart one, local media is growing. Good news. 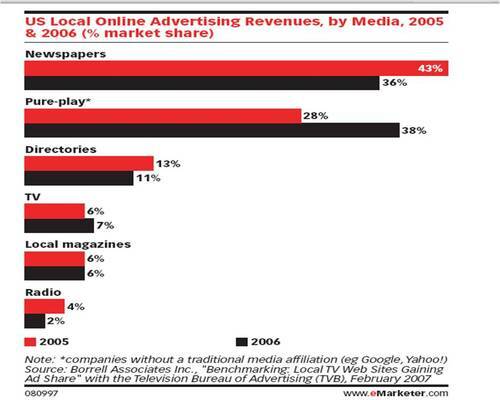 Second, national media is growing faster than local and will take market share away. Not such good news. Third, the scary news in growth of sales: while local publishers had flat online market share against year prior, with newspapers actually slipping, local pure play media organizations are galloping away with the prize. 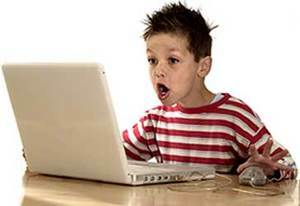 "Why didn't someone at Baltimore magazine start BaltimoreOnlineAdventures.com?"